Blue Rhino of Hamptonville, North Carolina is a leading supplier of gas grills, outdoor fireplaces and is a propane cylinder exchange facility. Blue Rhino Was Having Difficulty Keeping paint racks clean. In the past Blue Rhino would have to hand clean their racks and hooks. 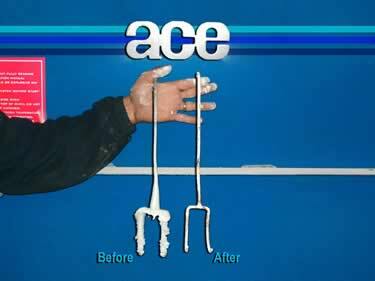 Heavy labor and hazards from chemicals motivated Blue Rhino to seek an outside cleaning source but after experiencing the high cost ($.60 per rack) and damage to parts, Blue Rhino Turned to ACE Equipment Company For Help. Mr. David Parker, Plant Manager at Blue Rhino, decided to bring the cleaning process back in house. The preferred method was Burn Off Ovens. Mr. Parker previously had some experience with Burn Off ovens and knew that many ovens on the market did not provide the control and safety required by Blue Rhino. After much research Mr. Parker decided on the ACE Hybrid Radiant Tube System. The Model 496 RT Hybrid Burn OFF Ovens System was recommended for high efficiency, energy savings and safe stripping of racks with no distortion or warping. “ I had experience with other ovens where parts were damaged, flames would shoot out of the stack and the oven was trash after just a few years. I wanted to make sure we got a safe, efficient and well built design this time.” The ACE oven system provides uniform, even heat with no hot and/or cold spots. 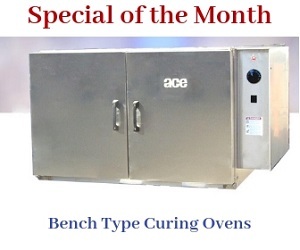 See the Complete Line Of ACE Burn OFF ovens Here.